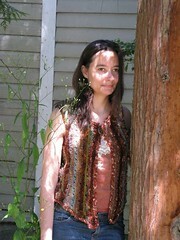 my mad scientist friend also dabbles with photography, and here is a photo he took of me wearing the painter's vest i knitted using a jane thornley pattern. www.janethornley.com. 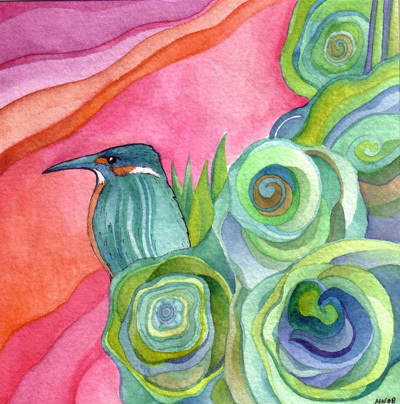 it was really fun to combine colors and textures. i want to do more of this kind of thing. i did when i first started knitting but then i got distracted by other people's patterns. not that they are not cool.. and true this is technically a pattern, but it's pretty much a free for all, too. that's a lot more relaxing than, say, lace knitting. it has been a productive day. 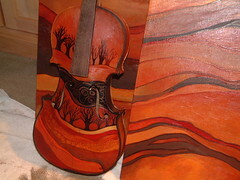 i am working on the painted violin and a 20x10" acrylic painting called "strata". acrylic paints and pitt pens. Last night i worked on an acrylic painting i started last year, part of a series, or well, more a body of work. which i would like to round out and seek a venue for. anyway, it felt really good. it should be done in 2 more sessions. it's 20"h x 10"w and is called Strata II. This painting here is Strata I. I think Strata II may end up being a bit more abstract, but we will see. sorry for the lack of updates! my shoulder and neck were still acting up so i was staying away from most of the art for weeks or so. that is starting to finally feel better, though i have been unwell in other ways. but at least i DID do some art this weekend.. i finished, finally, the may beaded journal house, which rounds out the year. 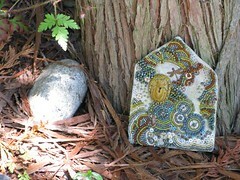 this one incorporates watch / blog parts, a brass dragonfly charm, and a ceramic button. The photo was taken by Audin Malmin, my mad scientist friend who i sometimes mention here. the 2nd was my favorite. i am also about done with Betty Macdonald's tale of living on vashon during WWII, which is called onions in the stew. you may know here name since she wrote the well known Mrs. Piggle Wiggle series for children, but she also wrote several delightful memoirs for adults, including the egg and i, which was made into a film. her sister,Mary Bard, also wrote books for both children and adults. so another high point of my trip to vashon was a chance to hear "just fiddlin' round" twice and buy their CDs. i WISH i could find a website for them. it does not appear they have one -- girls, if you google yourself and find this, you need a website! and get your CDs on CD baby, too! i want to tell everyone where to get your CDs! anyway, they are adorable and very talented. 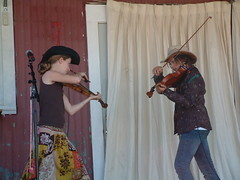 not only can they play fiddle, but they both have beautiful voices. it was a lot of fun. and they're both better at playing violin than i am -- oh, i need to practice more! my shoulder and neck are still messed up, but i have a massage appointment in a couple days. yesterday i went to vashon island, for the 2008 strawberry festival. i am not sure when the strawberry festival started, but it has been going on since i moved to vashon in 1977. i moved off the island around 1982. i still miss it and think of it as home. though nowadays so much has changed, when i visit, i feel like.. well, not a tourist, but an alumni. i did overhear a story about some musicians from out of town being given directions with reference to "the jesus barn". i found that highly amusing because it's a local landmark that fell down at least 20 years ago, yet people still tell you to turn after the jesus barn. anyway, i had a great time. heard some great music. 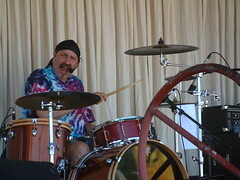 such as track 19. here is eddy j, the drummer, and also a friend of mine, getting ready to play their set. lots of other pictures on my flickr acct! 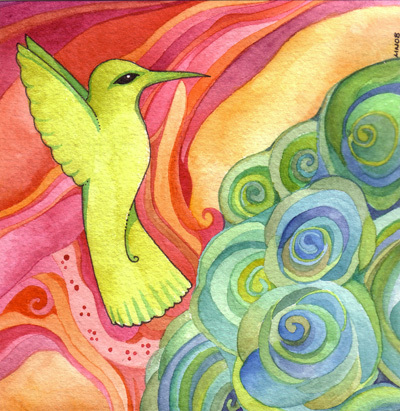 So, a lot of artsy folks blog these amazingly little pictures of their home, tableaus of serene beauty. I wanted to show you what I assume it is really like for most people who create in their homes, at least if their homes are small like mine. To that end I have posted 3 photos, incl. this one, on flickr, of how art supplies mingle with assorted clutter and things in my living space. 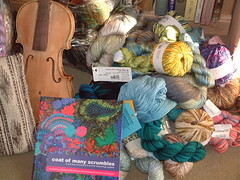 here we have the latest Prudence Mapstone book, a pile of yarn, a violin to paint, and a handwoven pillow from Mexico, lounging in front of one of my bookshelves. This is what it is like for most people, I think. Except some people have cats, in which case add some cat hair to the scene. These photos were unstaged. well, i have been a bit slower about making art recently.. sometimes i just feel lazy in summer, and i have been purposely limiting my art time for the last couple weeks due to some issues with my neck and right shoulder. (of course, i am right handed too.) so i have been trying to be careful particularly about knitting and drawing. i did do a bit of painting this weekend, which seems a little less wearing. i do have an appointment with a LMP next week. my island-friend (from vashon island where i grew up,) and i went to see Prudence Mapstone give a talk and show and tell over the weekend -- that was exciting! i want to make a freeform skirt! anyway, the paintings.. these are both for sale on etsy. They are 5x5" each.